British 19th C, except portraits, West Midlands: Artists and Subjects 34 comments Does 'On the Wye' depict St Margaret's in Welsh Bicknor? Could this be 'A view on the Wye, Welch Bickner (sic) church in the distance' related to a study exhibited at the British Institution in 1824 as no.4 (1ft 10in x 2ft 3in)? Welsh Bicknor is south of Ross on Wye and north of Symond's Yat – and the view would be looking north. The village is north of Lydbrook. A relatively recent photograph taken by Stuart Wilding shows a similar view http://www.geograph.org.uk/photo/1018103, where you can also find a map. 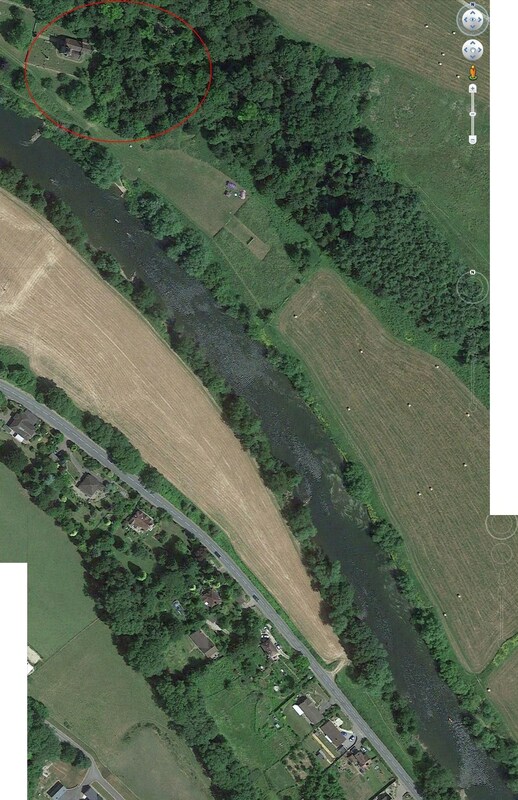 Confusingly, the Wye at this point is running north before it turns south again towards its mouth. 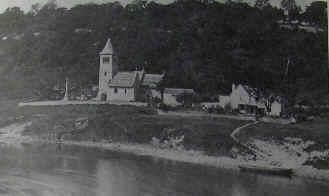 A photograph of the church is also to be found on the Wikipedia entry for the village. The church would be St Margaret's. The village was then in Monmouthshire, but since 1844 it has been in Herefordshire. I'm not sure what the "photograph of the church is also to be found on the Wikipedia entry for the village" has to do with this painting. Virtually 'anyone' can post virtually 'anything' to any Wikipedia site so whatever is there is has no relevance. No one should ever lend any credibility to anything posted on Wikipedia...it is not a trustworthy site. Jodi, I think most of us here are aware of Wikipedia's limitations. Fortunately most entries on subjects we are interested in are uncontentious, and attract little in the way of spurious contributions. Wikipedia is far more reliable than it used to be, and the vast majority of information found there nowadays is pretty accurate, and uploaded by well-meaning and informed contributors. No-one is suggesting using it as the last word on anything - but it is nevertheless a useful starting-off point for further research, not least because the site's owners now insist that articles give supporting references, and these are often in the form of links to other useful sources. In this case I can assure you that the photo on Wiki is indeed of the current church of St Margaret's, Welsh Bicknor, as the links given there fully confirm. Back to the matter in hand. This is a most interesting one, Martin, and powerfully illustrates how easy it is to be misled by present day appearances - even of a view that remains largely rural. On looking in detail at the Google Earth view (see attachment 1) and various pictures of the church and surroundings, I initially wasn't convinced. There is no trace today of any building or buildings to the right of the church, while there seems to be a substantial one with three gables in the painting (see attachment 2 for an enlarged detail). The church seems rather further from the river than the artist shows; and though the basic shape and orientation is much the same, the building detail and fenestration seem different. And finally the slow and glass-smooth river in the painting, with two barges sailing gently down it, seems very much at odds with the shallow, fast-moving stream with frequent riffles visible in the current satellite view - I found it hard to believe it could have been navigable in this way, even 200 years ago. So I spent ages looking for other small riverside churches on the Wye without success. The first image has failed to upload - I will try again. Well, I was wrong. Two old photographs of c1870 & 1893 (attachments 3 & 4) show buildings to the right just where they should be (albeit of rather different form); and 'An Inventory of the Historical Monuments in Herefordshire, Volume 1' (see http://bit.ly/2DsIukD ) reveals that c1930 there were still two substantial houses in the right position - and that the church was entirely rebuilt in 1858. The first detailed map I can source (25" OS surveyed 1877-87) shows them in detail sitting side-by-side (attachment 5), and it's easy to see how Watts might have misunderstood them at a distance, and rationalized what he could see into one more picturesque structure. The (new) rectory to the left of the church was apparently not built until 1868 (see http://bit.ly/2DoIH43 ), so would not have featured in the painting. The map furthermore shows an adjacent ferry and landing stages, indicating the river was in fact to some extent navigable - and looking at previous Google Earth images from winter and spring (e.g. Jan 2001, attachment 6) I now realize that the current one visible was captured at the end of summer (July 2013) when the water must have been unusually low. With more water it is noticeably smoother and deeper, and a shallow-draught barge could easily have sailed downstream. Having said that, I've no doubt Watts exaggerated its placidity (and probably width) for artistic effect. Images 3, 5 & 6 did not upload. I will try them again, too. I have not checked the lie of the background land in precise detail, but it seems right, with the hills we see in our painting sending the Wye twisting and turning round them all the way up the valley. All in all, I've now no doubt that Martin is right, and that this is indeed a view of the Wye with Welsh Bicknor church beyond. Martin, the one you found exhibited at the BI in 1824 must indeed have been a study from a recent visit to the Wye valley - the same year he exhibited several other nearby views (at Wilton, Walford, Goodrich, Bicknor and down to Monmouth) at the BI & the RA, the ones at the BI being almost all such small works. However five years later (1829) he exhibited at the RA another 'View on the Wye, Welch Bignor Church in the distance' (#433) - it seems likely that this was a larger, showier piece that he'd worked on in the intervening years, and in all probability this very painting. See http://bit.ly/2n10yrN . "No. 433, View on the Wye, Welsh Bicknor Church in the Distance; F. W. Watts. This picture is totally different in style, but not less estimable; from the rushing torrent, we pass to the gentle pellucid stream. Mr. Watts has gained a fresh wreath by the execution of this fine study from nature." "No. 433. View on the Wye; Welch (sic) Bicknor Church in the Distance. F. W. Watts. From the bold and agitated torrent we pass to the gentle and placid stream, reflecting as in a mirror the various objects by which its banks are fringed. The truth and simplicity of this fine study from nature....claim our highest admiration." 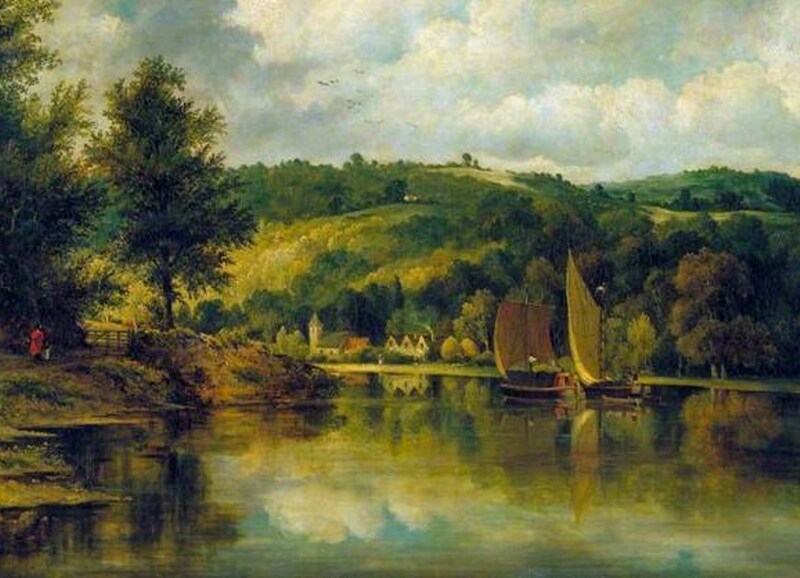 It is worth looking at the attached composite to compare this discussion's painting with another 'View On the Wye, Welsh Bicknor Church in the Distance', also by Frederick Watts, which is in the collection of the Auckland Art Gallery in New Zealand. The Auckland Gallery could be consulted to find out if there are any exhibition labels on the back of their 'View' that might point towards their painting being the one that was exhibited at the RA in 1829. These could include the #433 or other display information. The one observation that I will make is that in neither work attached is there an obviously visible "bold and agitated torrent", unless such can be seen in the distance beside the church when the canvas is examined in close detail, which is rather difficult with the resolution available here. I am having no luck attaching the composite. ArtUk, is there a solution to this now-regular problem? Hi all, I'm trying to upload Kieran's attachment to this discussion, which should be attached below. Just to note, we seem to be experiencing an intermittent problem with attaching files to comments. Our technical company has been notified and are looking into it. Apologies for any inconvenience caused, and thanks for your patience. That didn't work immediately, but it should be visible above (after some poking around in our database). Again, thanks for your patience. Thanks Edward, as a work-around that seems to suffice, though the link is not active and has to be copied and pasted into a new window. 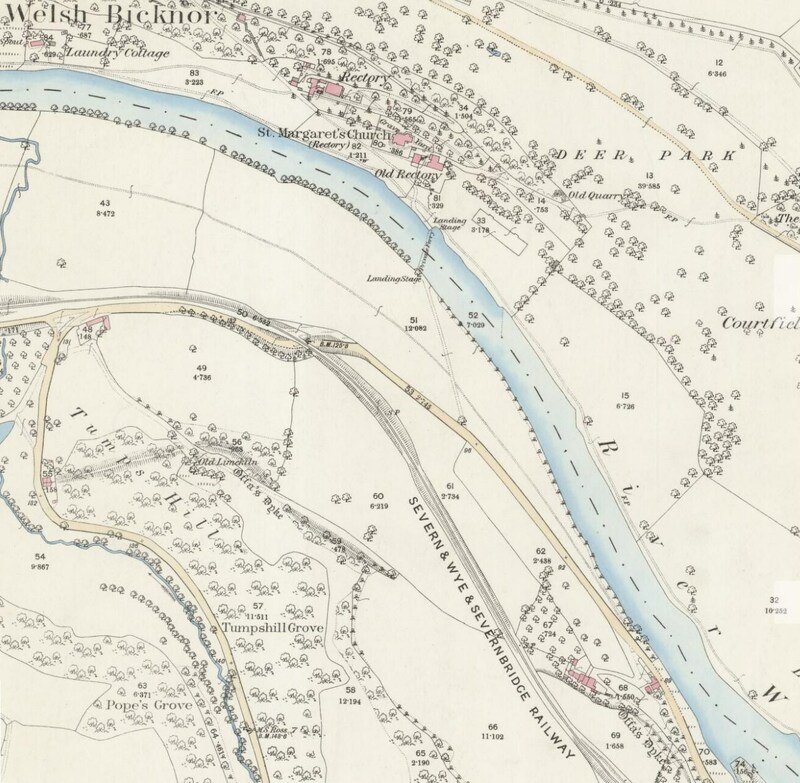 Here is another composite, this time including Osmund's useful 1870 OS map of Welsh Bicknor. It shows the sight line from the path just south of the private ferry landing, looking directly at Welsh Bicknor Church. It is a pretty convincing match. In the Auckland Gallery painting, the boat with the cattle can be seen leaving this landing point. The only question now is which of Watts' paintings of the Wye is it? 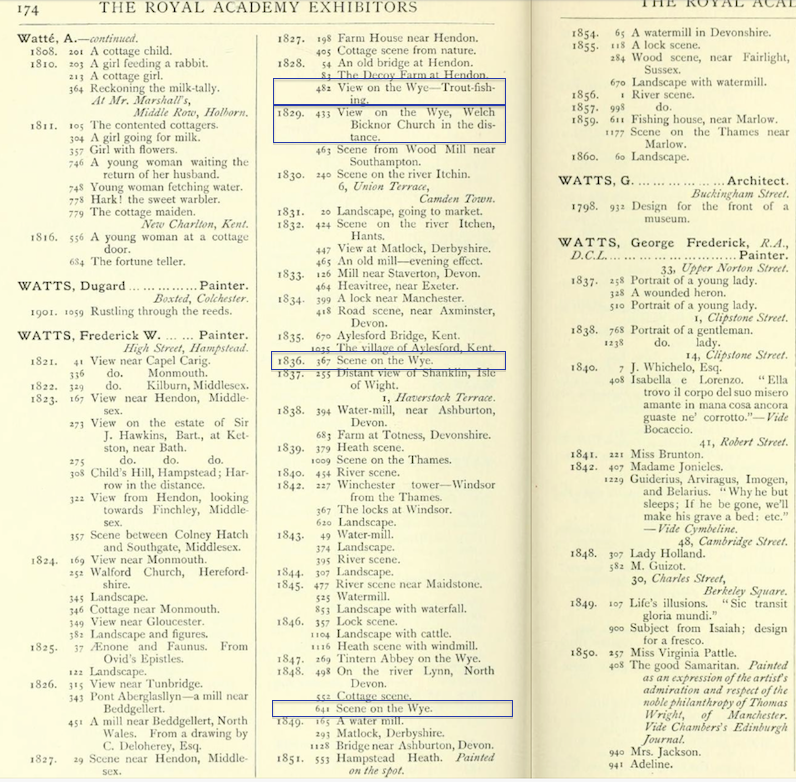 Attached (hopefully) is the list of his submissions to the Royal Academy, from which it can be seen that he presented (presumably different) depictions of the river Wye in 1828 (no.482), 1829 (no. 433), 1836 (no. 367) and 1848 (no. 641). These catalogue numbers might appear on the reverse side of his Wye paintings, which might aid in their specific identifications. No luck uploading those two attachments. Edward, I will email them to you, which I would appreciate it if you would post on the site as before. Lovely highres image on the V&A website (enlarge image, then click download link). No rushing or agitated torrent though. The V&A blurb also cites two 'Views on the Wye' by Watts exhibited at Liverpool Academy (1831 & 1836) as possible contenders. It could well be the the 1831 Liverpool Academy 'View on the Wye' was the one shown at the RA in 1829, and the 1836 Liverpool Academy 'View' was the one also shown in 1836 at the RA. One aspect of the composite that Edward so kindly posted above is that the density of the woodland surrounding St. Margaret's Church in the Auckland Gallery painting is much greater than that as depicted in the V&A work. Could it be that Watts returned to this scene after an intervening gap of nearly twenty years? Once again, an analysis of the backs of each of these works, and any others named as by Watts of the Wye, might yet reveal label and catalogue number information that could clarify these questions. 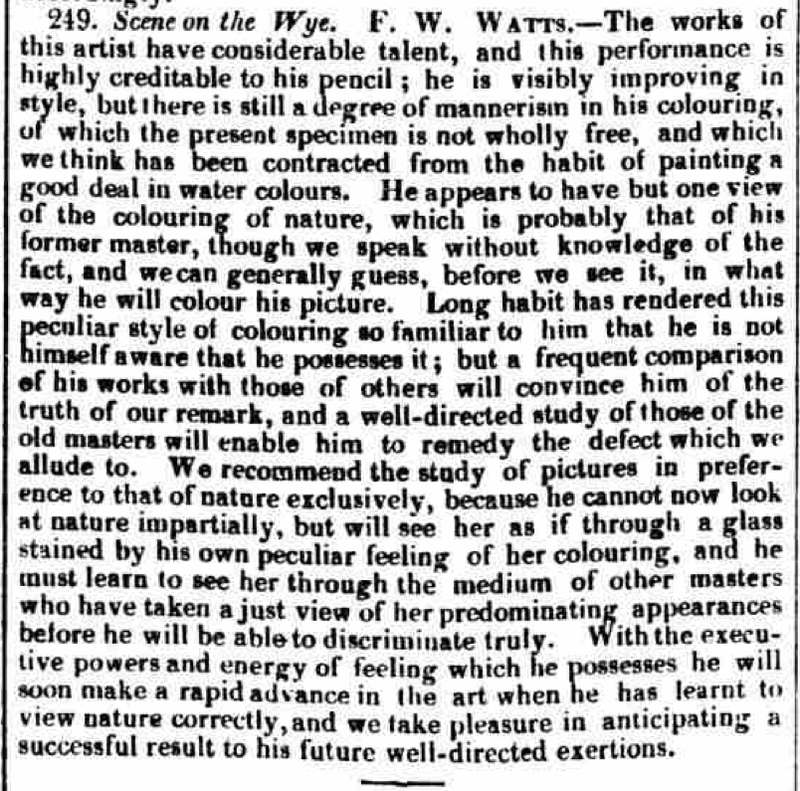 Additionally, the Morning Post of Monday 5th May 1834 describes Watt's contribution to the Society of British Artists exhibition (catalogue No. 249), thus: "The works of this artist have considerable talent, and this performance is highly creditable to his pencil." This suggests that the work was a watercolour or drawing study, rather than an oil. I will attempt to attach the full review here, but failing its successful uploading, I will send it to Edward at ArtUk to try, or otherwise will add it once the site's attachment problems are resolved. Note that the word 'pencil' commonly meant a brush (particularly a small brush) until the end of the 18th century and afterwards continued to be so used, particularly in a literary or poetic sense, as here. So it should not be assumed that Watt's SBA exhibit was drawing or watercolour. Those are excellent finds, Kieran. Here are direct links to both reviews (we will need them in context shortly): http://bit.ly/2nbzSnl and http://bit.ly/2FbxbcR . Tim, that's much better, thank you. For those still confused (as I was), after you enlarge on the V&A site ( http://bit.ly/2E6gLmW ), the 'download image' button is at the very bottom (right), and you may have to scroll down for it to be visible. It is precisely this that the review writer latches on to, and his description (in the second, longer review) of "...the gentle and placid stream, reflecting as in a mirror the various objects by which its banks are fringed" indicates to me that (if it's one or the other) the V&A's painting is the 1829 RA exhibited work, not the Auckland one. Though the resolution is poor, the reflections in the latter painting seem nothing like as mirror-like as ours (and fewer things are reflected), as the water surface appears more ruffled. In it Watts is attempting a less tranquil scene, with a cloudier sky apparently threatening rain, and – most significantly – a view of bare limestone crags rising above the steep wooded hillside immediately behind the church. This is a complete invention for the river at Welsh Bicknor, though such scenery is indeed found a few miles downstream at Symonds Yat, Fern Bank and below. So rather than being a later view of a changed landscape, I think in the Auckland work he combined elements from both places to create a wilder, more dramatic scene for a different romantic taste. Nope, they still go to the books' first pages. OK...for both put 'Bicknor' in the 'Search in this text' box. There is only one result for each - click on the dark blue page link and you're there. In fact even the V&A’s version cannot be taken as an accurate view (though it is much closer to truth than Auckland’s). Careful analysis of the real contours in the hills above and behind the church show that Watts has used some licence, and I’ve found a couple of photos that support this too. I will hope to be able to post map and other images demonstrating all of the above in due course. Re the viewpoint, although I haven’t seen Kieran’s composite featuring a suggested one at the ferry landing, I think this is much too close. Measurements on Google Earth indicate that the landing on the opposite bank was/is just 135 yards from the church, and little more than a hundred from the house(s) just to its south east. Surely this is far too short a distance for what we see, and for a description of “Welsh Bicknor Church in the distance”? The viewpoint was, I believe, much further upstream – possibly even as far as the coal wharf at Lydbrook (just before the river bends), which is just under 800 yards away. Again I have images (of maps and Google Earth) that I hope will illustrate this. I was going to try and use the Snaggy method myself, but this only gives you a screen-grab - too small an image to be of much use in showing important detail, unfortunately. Osmund, your suggestion that the two reviews compare two different paintings is perfectly correct. I should have been more alert to that, now obvious, interpretation of the reviewer's intention to move from the agitated torrent in the first work to the placid stream in the second work. You have now removed any concerns that might exist regarding the original question asked in this discussion. 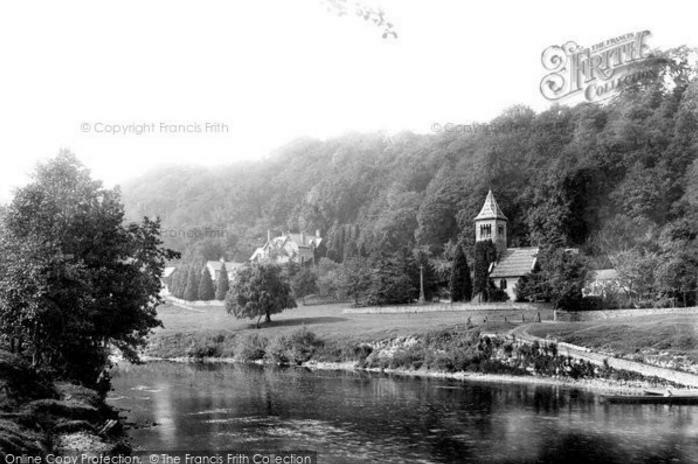 'Does 'On the Wye' depict St. Margaret's in Welsh Bicknor'. Surely the answer must be 'Yes'. 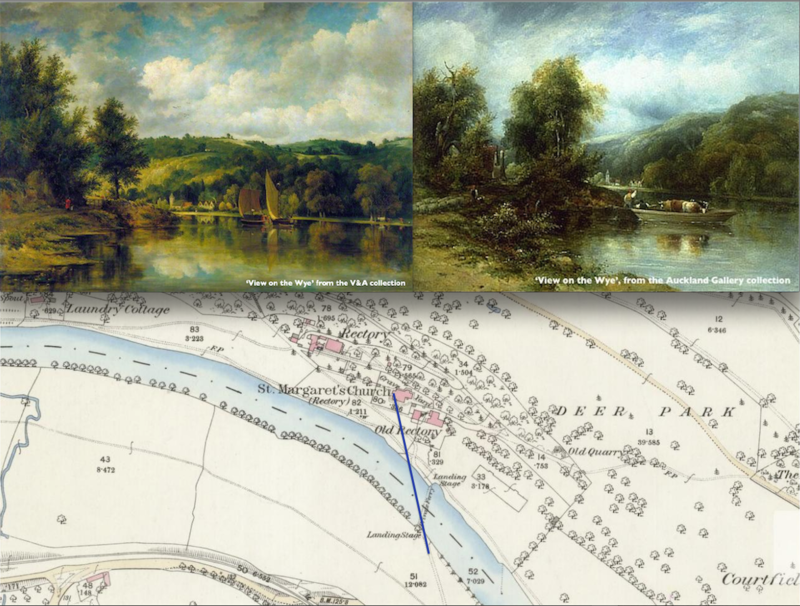 Regarding the viewpoint from which both paintings are executed, a spot at the coal wharf at Lydbrook seems a very long way off, and would surely result in a much greater stretch of the the river being depicted in both works. 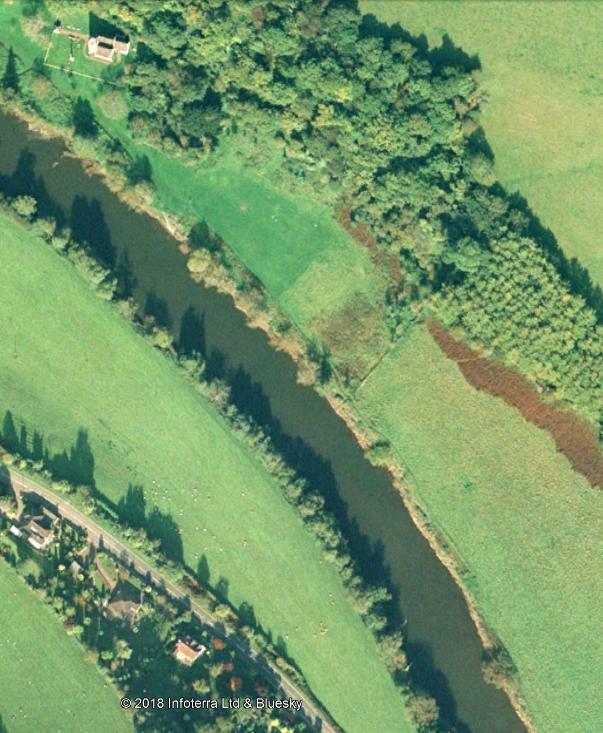 In addition, the only ferry crossing point shown on the OS map between Lydbrook and Welsh Bicknor village is the one indicated one your OS image, showing the landing stages of the private ferry service linking both sides of the river. In the Auckland painting, it makes sense that the ferryman with his cattle on board would be crossing to the nearest point on the opposite bank. It would make less sense that he was navigating such a bulky and weighty load downstream from near Lydbrook to Welsh Bicknor. By way of a compromise suggestion, perhaps the viewpoint lies between the near-bank ferry landing stage and Offa's Dyke, as shown on your OS map. Or perhaps somewhere around the 52/7.029 mark as shown there. One also has to take into account that Watt's, like Canaletto in many of his scenes of Venice, might be applying a certain degree of artists licence in the placing and juxtaposing of the elements that make up the completed painting. He is not necessarily trying to present an identical view of the scene but rather is depicting an idealised view of a personally much-admired riverscape. I wonder if the attachment facility is working again. 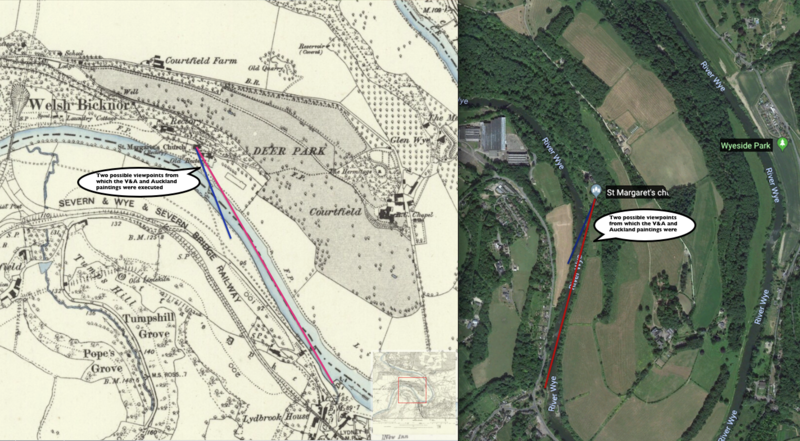 Here is the 1870's OS map juxtaposed beside the Google Earth image of the river Wye heading downstream from Lydbrook north to Welsh Bicknor, annotated with the two possible lines of sight as suggested in this discussion. Also attached is my own suggestion as to from where the viewpoint might be taken, as juxtaposed under the two images from the V&A collection and the Auckland Gallery collection. The Auckland Art Gallery have reported that their 'A View on the Wye, Welsh Bicknor Church in the Distance' was acquired by George Grey from Christie, Manson & Woods in 1869. Perhaps someone with contacts at Christies could ask them to search their records to see if they reveal any useful additional information. Kieran, you can't really ask Christie's Archives to try and track it down without the exact sale date or a stencil stock number from the back - they are very kind, but very busy! Sir George Grey's name may not even appear as such, as he'll most probably have used a dealer to buy for him. if you want to take it further, the Witt Library (Courtauld) may have the sale recorded under the artist; but being mainly a portraits man, I'm not very familiar with their resources. Other than that I guess someone will have to trawl through all the Christie's picture sale catalogues of 1869 (if they can find them), and pray that Auckland have the place & year right. Osmond, you are absolutely correct. That would be unfair on Christie's. Happily, Auckland are going to take some shots of the back of the painting, when they have it out of storage, and send the images on. They are also going to try to find a more precise day and month in 1869 for the sale. All of these details will be added to this discussion as soon as the information arrives. Brilliant news, Kieran - I look forward to hearing more anon. Hello everyone! I have just stumbled across this thread whilst looking for information on a local church, namely St. Margaret's of Welsh Bicknor. I'd like to commend you all on your research and investigations. I'm very familiar with the area and this painting really has the feel of it. I believe the view marked by the red line to be the correct one but to settle any doubt I will head down there in the next couple of weeks to take some reference photos for you all.